The son of the British commander at the Somme has defended his father on the eve of the battle's 90th anniversary. Field Marshal Douglas Haig's role in the World War I battle has made him a controversial military figure. Haig - buried at Dryburgh Abbey in the Borders - was a hero at the end of the war but subsequently branded by some historians as a "butcher". 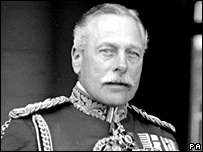 His son George Alexander Eugene Douglas Haig, 2nd Earl Haig, has spoken out to "set the record straight". He will not take any part in events to mark the battle of the Somme on Saturday. Speaking at the family country house in Melrose, however, the 88-year-old defended his father's name. "Nobody likes to see his father labelled as a butcher and I think it's very important for the good of this country to set the record straight," he said. "I found the criticism really rather difficult and sad as his leadership was paramount to winning the war. "The country could not get anyone better than him. "The Somme broke the backs of the Germans. "It was a very, very close-run thing and because of trench warfare and the weapons available, frontal assaults were the only way so casualties were inevitable." Lord Haig also spoke with affection of family life with his father. "He was not a brutish man, he was a very kind, wonderful man and by God, I miss him," he said. The field marshal's state funeral in 1928 at Westminster Abbey was attended by more than 100,000 mourners and he was buried at Dryburgh Abbey in the Borders. Despite the national hero worship, Haig was blamed for the war of attrition against Germany that saw hundreds of thousands perish. Some 20,000 British and Allied troops died on the first day of the 1916 Battle of the Somme, which has become synonymous with military futility. Lord Haig said he thought that now people were possibly starting to realise his father's importance. "I believe it has now turned full circle and people appreciate his contribution," he said. "But it saddens me my three sisters have not survived to see it. "They died suffering from the beastly attitudes of the public towards our father. "He was a great family man. We had some marvellous times together, fishing, and having picnics. "The only time when he could be quite strict was when he was teaching me to ride."